The Pakistani media is playing a proactive role in bringing forth cases of victims who have been dealt with unjustly or ignored due their poverty or social status. I have seen various cases being brought forth by broadcast media, which highlight the plight of poor people who are suffering from health ailments that can easily be cured if they had the resources. By putting the spotlight on such issues, they have helped these individuals by giving them exposure, sometimes the needed funds and also government intervention. In other cases, they have highlighted the stark contrast in how justice is delivered to opposite ends of the rich/poor spectrum. One such episode which would have left many alarmed would be the one I saw recently on Dawn News, an episode of ‘News Night with Talat Hussain.’ This particular episode showed two very different sides of justice; one was the prime minister’s indictment for contempt by the Supreme Court. At the other end of the spectrum, there was Arsalan Latif, a young boy from Gujranwala who was caught by the police for flying a kite. Gilani has the resources to hire the best lawyers and even if the court does find him guilty, he can still walk away using the ‘presidential pardon’ clause granted by the Pakistani constitution. Arsalan’s story, however, is quite the opposite. The boy was innocently playing one day, chasing after a kite which had been cut from its string. He caught the kite and after that, to bear the fruit of his labour, decided to play with the dor (string). The police arrived at the scene and caught him, making him spend one night in jail. Despite the fact that the kite flying ban is in place, this story is shocking. A 13-year-old boy was arrested, an FIR was filed against him and he now has a criminal record. When Arsalan saw the police, he was so terrified that he ran and hid in his bathroom. Since his parents were not at home, the police took him out, beat him up, handcuffed him and took him to the police station amidst the howls and sobs of his younger sister and brothers. Their whole family was traumatised. Arsalan had an exam the following day, which the police agreed to let him sit, but nonetheless, he spent the night in custody. Despite their poverty, his age and the petty crime, his family had to bail him out. Unlike the PM, these people did not have money to hire a lawyer. Being sent to prison brought shame upon the family in their neighbourhood, and traumatised the younger children. When Talat asked Arsalan’s nine-year-old brother about the incident, he started crying uncontrollably. 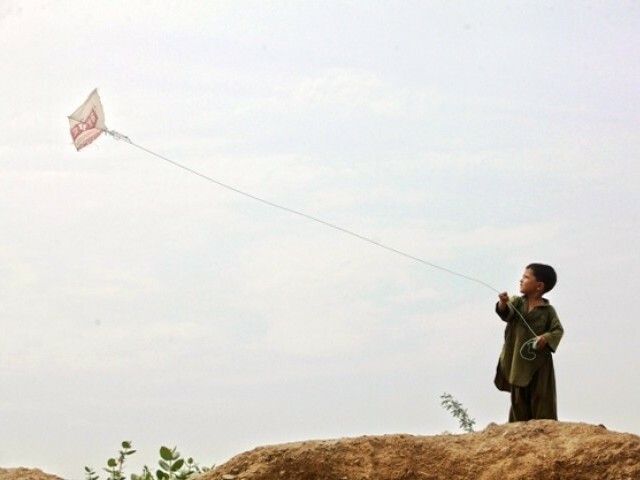 Arsalan himself could not help crying and said he would never fly a kite again. He recalled how he was beaten up at the police station and how he spent the whole night crying. I was outraged at the trauma and stress this situation brought to this young boy’s life. How could the police take such an irresponsible stance? I am sure there are many children like Arsalan. It is time our society stood up against the abuse of power and the ‘dark’ side of justice that remains ignored. I am grateful to and encourage our media for bringing forth such incidents so we can live in a more transparent society. When illeterate people in police will be recruited then this has to be happen. If the police are at all doing their duty. Kite flying is potential murder. Its not something to be taken lightly. It is not very different from firing in the air. All the cops involved should be punished because this is disgraceful. Its unfortunate that people are not understanding the article. It’s not about the kite ban or the police brutality. The PM goes to the Supreme Court waving his hands as if we has just won a battle and then having to decency or respect boasts how he has defied the court. But this poor boy whose crime was flying a kite doesn’t have that facility. He spends the night in jail, then beaten by the police and this will affect him for a long time.. That’s what the article is about..
does this so-called police has the guts to put handcuffs to those ADULTS from HIGH CLASS SOCIETY who are openly violating this???? Potential murder???? what about all the real murders that happen and the real murderers roaming free??? you just need to not presussrize your pea size brain. stupid fool. I’m not sure if you belong to the ghairat brigade, but where did I say that murderers should not be punished? A criminal is a criminal and must be handled according to the extent and severity of the crime. And kite flying is potential murder. Not a small crime. The child and his family should not be let go. The kid could have murdered someone innocent. The Zulm Republic of Pakistan. Unfortunately, the truth is police brutality and major inhumane and un-Islamic ethical violations are justified in Pakistan, sometimes in a twisted guise of superior national interest, morality or religious goal, especially against the weak and the poor.